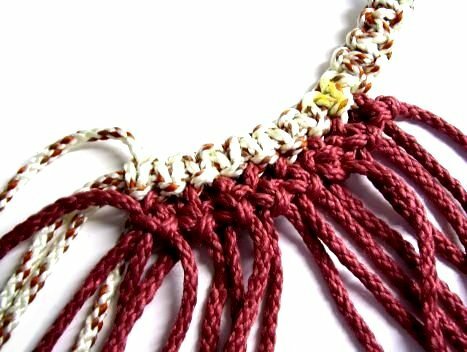 Description: The Teardrop Purse design is a great Macrame pattern to help you learn important skills such as adding cords and creating symmetry. The name comes from the fact that the straps form a oval teardrop shape. You can make it with one or two colors, and use either natural or synthetic materials. Bonnie Braid cord was used in the example shown (polypropylene). Color A is the ivory flecked material, and color B is cranberry. This Macrame project is advanced, so is not suitable for beginners. The finished size is approximately 12 inches wide x 20 inches tall, which includes the strap. Note: The Square Knots in the Teardrop Purse all have 2 fillers and 2 working cords. 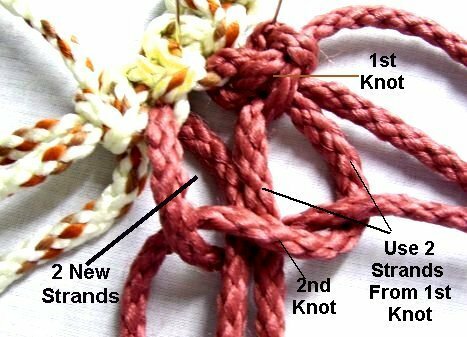 Make sure you know how to tie the knots in both directions, or this project will be difficult for you to complete. Youll be cutting cords as you progress through the pattern, rather than all at the beginning. Put tape on the ends, for easy identification later on, and to prevent unraveling. Step 1: Use two 4-yard cords and two 6-yard cords for each strap. For the first one, secure the center of the 4 cords to your project board, arranged vertically in the following arrangement. Mentally number them as well. Step 2: Tie a left Square Knot in the center of the cords, next to the pins. Cords 1 and 4 are the working cords. Secure the knot and remove the remaining pins. Step 3: Tie 24 left Square Knots with the 4 cords, as you did in step 2. Step 4: Turn the design around, and go back to the center. Repeat step 3. Important: You need to switch to right SK for the second half, so the pattern is the same. This is considered strap 1. Repeat Steps 1 - 4, using the remaining cords, to make strap 2. Tie right SK for the first half, and left SK for the second half (opposite of other strap). Step 5: Cut 16 cords, (color B), each 3 yards long. Prepare the ends with glue, a knot, or tape. These cords will be called the body cords, since they are used to form the main portion of the Teardrop Purse. You should sit facing one end of strap 2 for these next steps. Important: Make sure the knot in front of you is a right SK. Turn the strap around if necessary. Mentally number the cords in the strap 1 - 4, and make sure it's face up. Add one body cord to the 4th strap cord, which is the working cord on the right. To do this, center the new cord underneath, and secure it with a pin. Step 6: Tie a right SK, using only the four strap cords (color A). This will hold the new body cord in place, since it's between the two knots. Design Tip: Mark this knot with tape or a pin, so you can easily find it later. In the images, the knot was colored yellow so you can see it better. Step 7: Add a second body cord, by folding it in half and placing it to the right of the one previously added. Secure it with a pin. 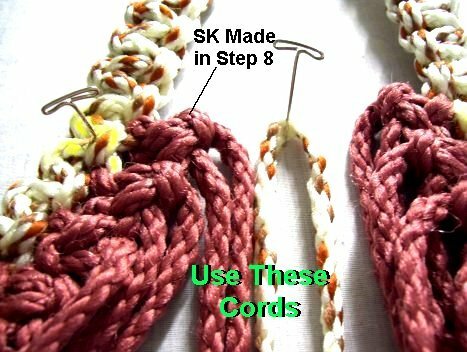 Step 8: Tie a right SK, combining both halves of the new cord with those from the first body cord you added (Color B only). This knot will rest beside the strap. Important: Pull on the filler cords to remove any slack above the knot. Step 9: Add the 3rd body cord to strap cord 4, coming from the last SK you tied in step 6. Center it, and secure it with a pin. Tie a right SK, using only the four strap cords. Step 10: Tie a right SK using both halves of the new cord, along with two of the body cords next to it, which are from the knot you made in step 8. Attach each body cord onto cord 4 of the previous knot tied in the strap. Then you tie another knot in the strap to hold it in place. 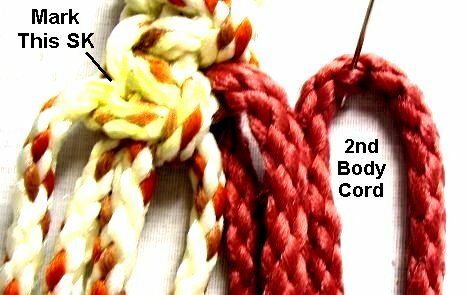 Next, you combine the two halves of the new body cord with two next to them (same color). Step 11: Repeat steps 9 and 10, adding 5 more body cords (total of 8). The following steps mimic the ones you just completed, but left SK are tied. 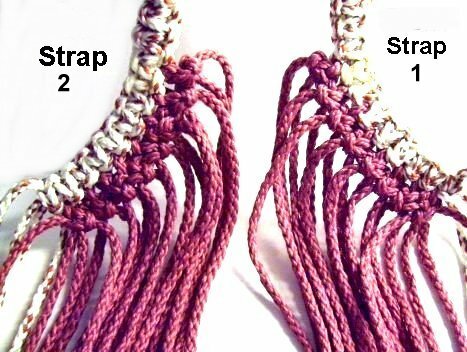 Step 12: You will now use strap 1 of the Teardrop Purse. Verify that the knot in front of you is a left SK. Mentally number the cords 1 - 4. Step 13: Add one body cord to strap cord 1, which is furthest to the left. Center the new cord underneath it, and secure it with a pin. Tie a left SK, using only the strap cords. Mark this knot in some way, so you can find it easily. Step 14: Add another body cord, by folding it in half, securing it to the left of the one added in the previous step. Step 15: Tie a left SK, using both halves of this new cord combined with the previous body cord added in step 13. Pull on the filler cords to remove any slack. 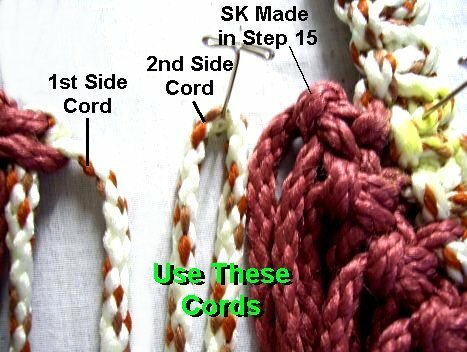 Step 16: Add a another body cord to strap cord 1, which comes from the SK tied previously (step 13). Center it, and secure it with a pin. Tie a SK with the strap cords to hold it in place. Tie a SK using the new body cord just added, along with 2 of the adjacent cords (color B), which are from the previous knot tied in step 15. Step 17: Repeat step 16 to add the remaining body cords (total of 8). When finished, half the cords for the body will have been added to the straps of the Teardrop Purse. Step 18: Repeat steps 5 - 17, to add 8 more body cords to the other end of both straps (total of 16 on each strap). Strap 2 will now have body cords added onto cord 1, tied with left SK. Use the directions for steps 12 - 17. For strap 1, the body cords are added to cord 4 in the strap, with right SK. Follow the directions for steps 5 - 11. Step 19: To begin the first side of the Teardrop Purse, re-secure the design. The straps should be resting vertically, approximately 2 inches apart. Strap 2 should be on the left, with the body cords having right SK. These cords are referred to as side cords in the instructions below. Tie an Overhand knot at the tips, to make it easy to identify them later on. Fold 1 side cord in half, and secure it between the two strap designs. It should line up with the right SK you tied in step 8 (first body cord added). Step 19, continued: Tie a left SK with the 2 halves of the side cord, along with the 2 body cords to the LEFT of it. 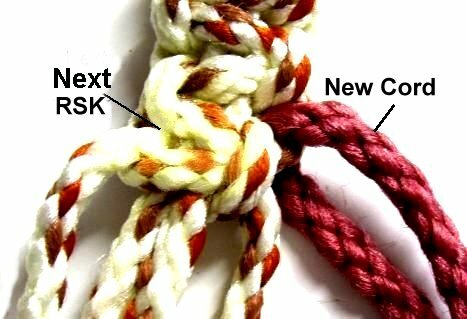 This new knot will be made up of both colors, and will face the opposite direction of the body cords. This will form the striped pattern for the gusset. Pull down on the fillers to remove the slack and the loops above the knot. Step 20: Fold the other side cord in half, and secure it to right of the first side cord, close to the body cords on the right. Tie a right SK with the two halves combined with the first two body cords coming from the right strap. In each new row you will add two additional body cords that are attached to the straps. This will cause the side section of the Teardrop Purse to widen, since you are tying more knots as you progress. 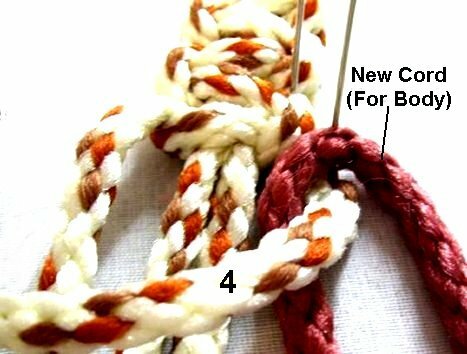 Remember that Alternating Square Knots are made by using 2 cords coming from two adjacent knots in the previous row. 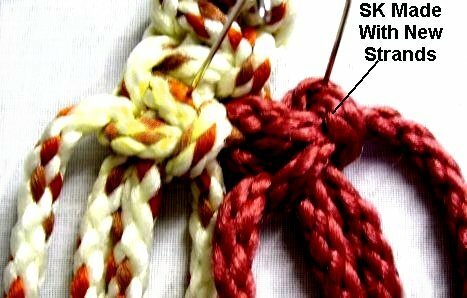 The knots made with Color A will form a stripe. They are all tied with Left SK. 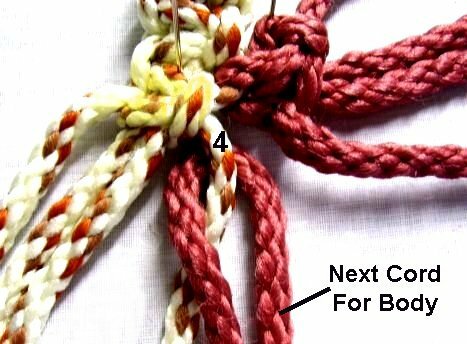 The mixed color knots will face the opposite from those made by the color B cords. Below is specific information as to the direction of the knots, but you should double check the direction as you progress. Important: The numbers below indicate how many knots are tied in the row. So for row 3, there are a total of 5 knots in the entire row. Make sure you only tie one knot with each set of four cords. Step 22: Repeat steps 19 - 21 to create the second side panel, at the other end of the straps. Step 23: Fold the design at the side panels so the straps are at the top of your work surface, directly in front of you. The loose ends should be heading vertically (downward). The side designs you just made should be to the right and left. One strap will be lying on top of the other. Bring the remaining portion of the strap cords towards each other at the center, forming a teardrop shaped design. These cords should all be color A, and there is tape on the ends of them. The 8 cords for the front half (on top) should be from the same strap. Ignore the 8 cords for the back half (bottom) for now. Step 24: Mentally number the 8 strap cords. You will now make a SK button for the front of the Teardrop Purse. Skip past step 24 if you do not want this decoration, and use the instructions for step 25 instead. Step 24: Use cords 3 - 6 to tie one Square Knot. Move down ¼-inch and tie a short sennit of 4 Square Knots. Pass the ends through the space, from front to back, to form the Button. Tie a Left SK with cords 1 - 4, and a Right SK with cords 5 - 8, just below it. Step 25: Flip the Teardrop Purse upside down to work on the back half. Mentally number the strap cords in the center 1 - 8. Tie a tight left SK with cords 3 - 6. Just below, tie a Left SK with cords 1 - 4, and a Right SK with cords 5 - 8. Step 26: Organize all the cords into 2 groups, the front and the back. This is easier if you can hang the purse by the straps, so the cords dangle freely. Make sure the sides of the Teardrop Purse are to the right and left. The knots you tied in steps 24 and 25 are in the center of the design. Step 27: Tie one row of Alternating Square Knots, in the front section. Tie left Square Knots to the left of the center, and right Square Knots on the right. They should match the ones nearby. The knot in the center, which lines up with the button knot, should be a left Square Knot. Repeat step 27 to start the back section of the Teardrop Purse. 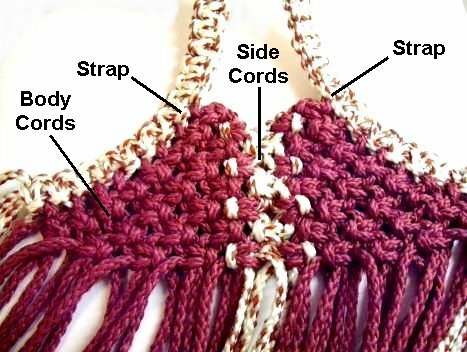 Step 28: Join the front and back of the Teardrop Purse by tying ASK with the color A side cords, on both the left and right areas of the design. Important: The direction of the knots should match those in the gusset. Step 29: Continue to make the Alternating SK pattern, moving around both halves of the Teardrop purse. You should have enough material to tie a total of 16 to 18 rows. When you get to the sides, the direction of the SK should match those in the area. Just look at the knots above where you are working to see the pattern. Step 30: You need at least 12 inches to finish the Teardrop Purse, so measure the shortest cords if you decide to make additional rows. 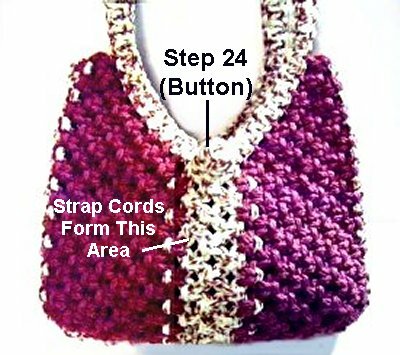 Drop the 4 color B cords that are closest to the side cords (color A), at both sides of the purse (total of 8). Drop the same cords on the back half as well. Just push them to the inside of the purse and don't use them for the next row. Tie a final row of Alternating Square Knots with the remaining cords. Step 32: To close the bottom, turn the Teardrop Purse inside out, and hold it between your knees. Tie tight Overhand Knots using sets of 2 cords. Make sure you select one cord from the back and the front to tie one knot. Apply glue prior to tightening, so it's on the inside of these knots. To make sure you use all the cords (including the ones you dropped), trim each cord to 2 inches after each knot is tied. Step 33: When the glue is dry, trim all the cords more, to 1-inch in length, and unravel them completely. This makes a fluffy fringe on the inside of the Teardrop Purse. Turn the handbag right side out, and its ready to use. 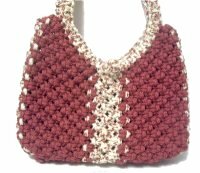 Have questions about the Teardrop Purse? Contact Me.